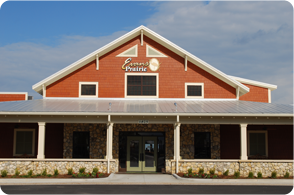 Evans Prairie Country Club is a casual fine dining restaurant inspired by a Western flair while serving delicious cuisine in an intimate dining atmosphere. As the newest country club in The Villages and as an extension of Brownwood Town Square, you will find our rustic décor pleasing to the eyes and our exceptional food a delight to your pallet. Upon entering the country club, you are immediately met with a semi-open floor plan perfect for a quiet dinner for two or dining areas sized to accommodate larger groups. Wrought iron chandeliers grace our dining areas accented by wood-like floors giving you a feel of being in the Old West. Comfortable and inviting, our outside bar will delight your senses while the patio and outside tables provide a scenic up-close view of beautiful Evans Prairie. Whether coming off the links designed by Ken Ezell, or as a stopping point before enjoying live entertainment at Brownwood Town Square, Evans Prairie Country Club is destined to be a local favorite. Our western-style menu is chock-full of cuisine you would expect to find to the “period of time”, including citrus infused salads, hearty steak dishes and fresh mouthwatering seafood; while staying reasonably priced. Evans Prairie’s specialty drinks and our eclectic dessert menu are sure to have you satisfied and we greatly value your guest experience from each and every visit. We take pride and strive to ensure total satisfaction through outstanding customer service and unbeatable value to make your dining experience something to remember. We take pride and strive to ensure total satisfaction through outstanding customer service and unbeatable value to make your dining experience something to remember. We offer high quality, made from scratch food everyday served in a casual fine dining environment. Food and hospitality is our passion here. We are looking for professional and reliable individuals that can extend our passion for this industry towards our guests. Employment qualifies for The Villages Charter School eligibility. Evans Prairie Restaurant is an equal opportunity employer.